Even tho it looks a little like aloe vera it is smaller with more branches. It grows up and then spreads out. My neighbour cut hers back, it seemed to be dying off but she noticed that babies were coming up from bottom so she gave me some cuttings show in pictures. Mot sure how to root nor care for this unnamed plant. 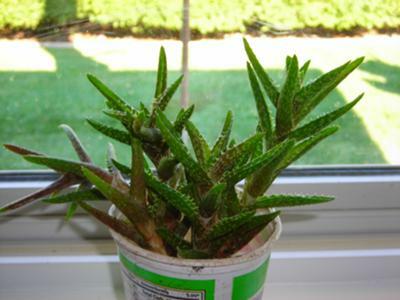 Hi Lori, this is an Aloe, just a different species than Aloe vera. This is one of my favorite ones, as it stays compact and just makes more growth from existing branches, instead of getting huge and out of control. 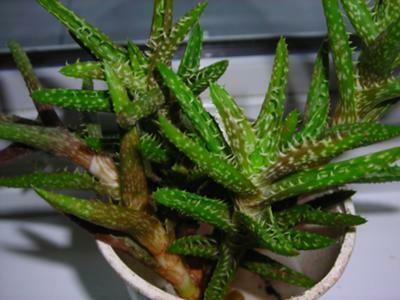 Its botanical name is Aloe juvenna, or also known as Aloe zanzibarica - these could be two different ones, but they're mixed up in the nursery trade, as they're so similar. Hope this helps with your question - Happy Succulent Gardening! i'm back again. i showed my friend your reply and the name of our plant. she says it really is not all that compact but its branches trail from centre and then as branch gets longer the branch turns brown and only the ends of the branch leaves stay green. i checked for Zanzibar aloe and read that it develops little upright rosettes that elongate over time and travel horizontally, rooting as they go. In addition, it produces lateral plantlets, or pups, over time to form colonies. Sometimes the original point of attachment to the mother plant rots away and the pups become independent to start the process over again. this sounds more like what hers is like. except hers don't root as they go for they hang over her pot. maybe they would root. good thing to try.